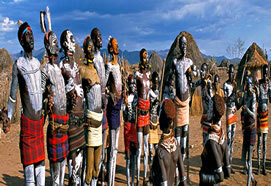 In this unforgettable tour, you will take a deep plunge into Ethiopia’s unique history. The historical route through Northern Ethiopia will take you through the country’s most famous attractions, such as Lalibela’s famous rock-carved churches and Gondar’s 16th century castles and churches. The bike rides are brilliant and exciting, and will take you through breath-taking ever changing scenery. The first riding days will take you all the way to Mekele the capital of the Tigray region through a mix of asphalt and gravel roads. 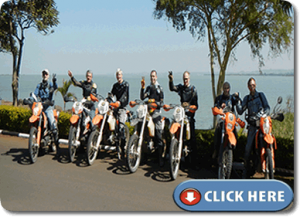 Ride through scenic asphalt roads and breathtaking scenery, through different altitudes and great fun twisted roads. Kombolcha is the place to try the best fetira in Ethiopia (traditional food eaten for breakfast) in one of the local Cafes. This will be the best breakfast of the whole trip and you should not leave town without trying it. Enjoy your meal! A spectacular 1,500 meters ascent will lead you to Lalibela set at an altitude of 2,630 meters. Lalibela, also known as the kingdom of the living rock or African Jerusalem is famous for its churches carved out from red volcanic rock dating back to the 12th and 13th Centuries. 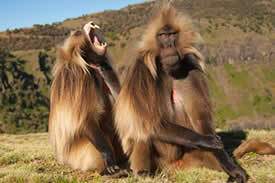 Ethiopia is home to more World Heritage sites than most countries in Africa. 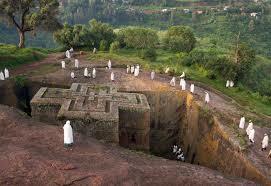 The churches at Lalibela are perhaps the most prominent of all and Ethiopia ‘s top attraction. You will continue to have lots of fun during these next 4 days. The landscape will change but will be every inch as beautiful. The park is interesting because of the uniqueness of its endemic animals, the beauty of its flora and the majesty of its impressive landscape. If you would like to rest from the bike and do some trekking this is the right place. The last 4 days of this trip will be spent in Gondar and Bahir Dar. 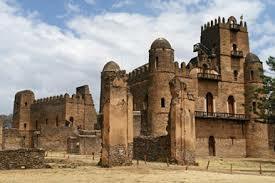 Gondar, also known as the Camelot of Africa is considered one of the most beautiful cities in the country. Visit the Castle-Palace of King Fasilidas and the Church of Debre Birhan Sellassie (Mount of Light of the Holy Trinity) famous for its beautiful winged angel decorated ceilings and many other frescos. Bahir Dar is situated on the edge of the fabled Lake Tana, the source of the Blue Nile. Its shore-dwellers, both farmers and fishermen, navigate the waters in their tankwas, handmade papyrus canoes, the sight of which takes us to Ancient Egypt. During the 13th and 14th century this region received monks seeking the isolation and peace ideal for lives devoted to prayer, fasting and study. The result was the construction in Lake Tana’s small islands of small monasteries alongside churches well worth visiting. Departure to Addis. 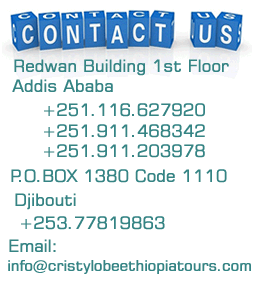 In the evening we will have a farewell dinner in one of the best restaurants of Addis. There are many good Restaurants, Bars, Discos, Jazz Live Music and Cultural Dance venues to offer if you want to extend your stay.